Congress’ job approval ratings have sunk to around 20 percent, while their disapproval is up to an average of 73.4 percent. Yet for all of America’s dissatisfaction—and Congress’ failure to combat the nation’s fiscal crisis—Members of Congress are earning salaries and fringe benefits that far exceed those of the average American, according to a new report by Our Generation and the Taxpayers Protection Alliance. The report details how Members of Congress earn a salary of $174,000—that’s 3.4 times higher than the average full-time American worker, who earns $50,875 per year. Even if you compare Members of Congress to more educated, private sector employees, they’re still doing pretty well—those Americans earn on average $83,000 per year according to the Bureau of Labor Statistics. But Our Generation and the Taxpayers Protection Alliance report that the congressional base salary is just the beginning. If you count the $110,000 in taxpayer-funded fringe benefits Members receive (including plush retirement plans, paid time off, and contributions to Social Security and Medicare taxes), they’re earning close to $285,000 per year. The report goes a step further and compares Congress’ salaries and benefits to 12 other developed nations (using a ratio of legislators’ salaries to wages for average full-time workers). The result? 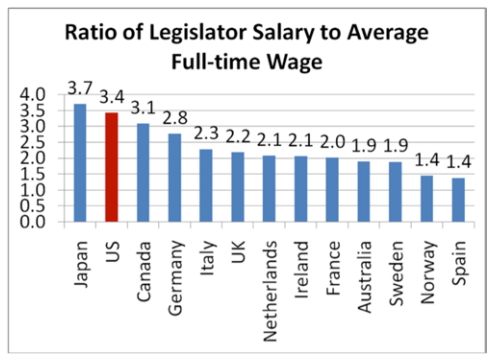 Members of Congress are the second highest paid internationally, falling just below Japan. The average federal employee earns an annual salary almost 60% higher than the average private-sector employee — $79,000 vs. $50,000. Federal employees do have more education (on average) than private-sector workers. Their unions argue that this justifies their higher pay. But it doesn’t. Even after controlling for education and experience, federal employees get paid significantly better — 22% more per hour, on average — than private-sector workers. Though not all federal workers earn above-market pay, Sherk explains that “Overall, government workers earn well above what their private-sector counterparts make, even before you consider benefits.” And those benefits include near-absolute job security, robust retirement and health benefits plans, paid leave, group life insurance, and even on-site child care. So it seems that the job of a Member of Congress or a federal employee isn’t a bad one, if you can get it. The grass is greener on the other side, and the U.S. taxpayers are paying to keep it that way. Click here for the full report “Are Taxpayers Getting Their Money’s Worth?” by Our Generation and the Taxpayers Protection Alliance.